(at the school) ...lighted and open to the public when not in use by the school. 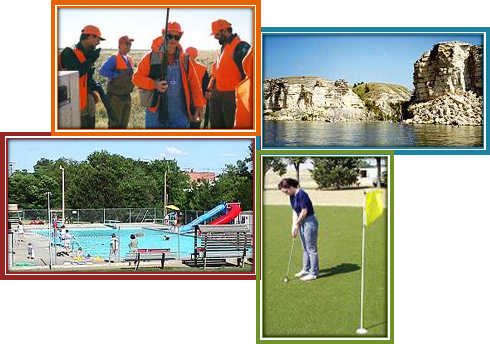 Ness County is a prime spot for the avid hunter with over 15,000 acres of land set aside for Walk-in Hunting. Pheasant, quail and dove habitat is easily accessible; deer hunting also offers a great experience throughout the county. Goodman State Fishing Lake & Wildlife Area - Located 5 miles south and 2.5 miles east of Ness City; the area has a 40 acre lake and a 225 acre upland wildlife area. Cedar Bluff Reservoir - Located 34 miles northeast of Ness City on K-147; the reservoir offers great fishing and camping.